Why create Mind map? Because it’s the easiest way to get your thoughts out of your mind. Instead of writing down, one can also just draw rough map, so that the final outcome becomes better. In some tasks, it’s all about planning. Mind mapping also increases productivity in some cases. In this article, we will be learning how to create mind map with the help of MindMeister, a free online tool, so that you don’t need to purchase any mind map software. Tony Buzan has suggested some guidelines to create mind mapping. Basically the aim is to create effective mind maps using symbols, colors, codes, etc. which can be easily understood. The aim is not to make something complex, but simple and easy to understand. Below is a screenshot showing the details of the Tools which can be used. The above mind map is created under 5 minutes. You just need to pick the tool and start drawing, its too easy. In the top of the screen, you will see Add, Delete, Connect, Cut, Copy, Paste, Undo, Export and Print. The whole screen is pretty self explanatory. Below is an explanation. Now let’s take a look at the right sidebar. 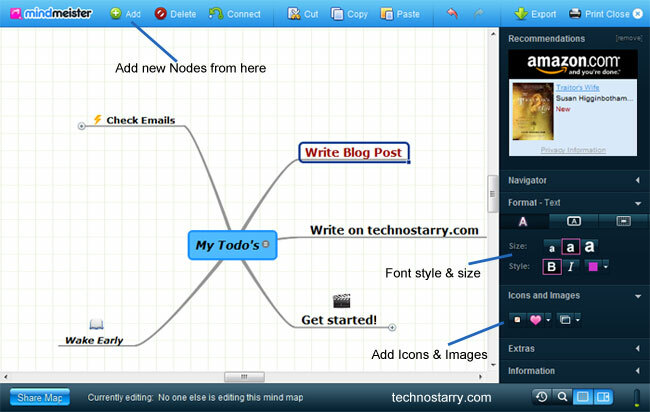 After creating the mind map, you can save it or share with other persons. When sharing, you can also allow that person to edit this mind map. Navigating and getting the stuff done in this brainstorming tool is very easy. Really, its too easy and many things are just self explanatory. So go ahead and try this free online tool to create mind maps.